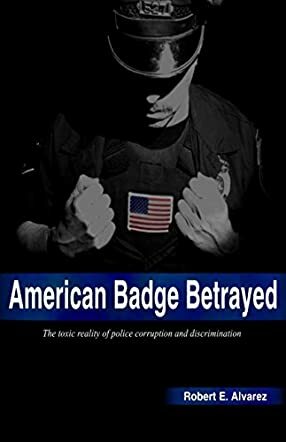 American Badge Betrayed by Robert E Alvarez tells the story of how an altercation between himself and another police officer at the scene of an arrest started the ball rolling on a nine-year battle to clear his name, regain the status level he had already achieved working in the police department, and open the door for further promotional opportunities. On the face of it, this brief argument - which included minor pushing and shoving - escalated over the years, and throughout the book, Alvarez backs up his account with documented proof, which starts even before the court case and the subsequent appeal. Towards the end of his book, Robert E Alvarez tells us that he was prompted to write and publish his book as Hollywood was soon to release a film about the Boston Marathon Massacre. He wanted to expose in particular the unethical behaviour of the man praised for successfully directing the efficient and commendable work done by the police force under his command. Ed Davis stole the limelight and took all the credit - the same police chief who had on many occasions, according to the author, practiced blatant discrimination and won promotion for his excellent work in the police force, whereas the exact opposite is true. Hollywood has never been known for letting the truth get in the way of a good story. You have to admire Alvarez for relentlessly pursuing his principles and his ingrained passion for the truth. It may not be portrayed on our television screens, but the thinking public is probably aware that cronyism, favouritism and networking is not only prevalent in the police force, but at every level of council, state, government and corporate business. It’s what keeps the wheels turning, despite people being placed in positions for which they are neither suited nor qualified. People in power will lie, steal, cheat, perjure and bully their way to the top and, once there, threaten anyone in a subordinate position who fails to support them. This book is yet another account of how the world is really run and, sadly, will continue to be run as long as power, greed, and the old boy network lasts. I applaud the author for his courage, but although he eventually won his court case and was awarded almost minimal damages, in the end those who perpetrated the injustice escaped censure and emerged unscathed. A sad reflection on our society. A former Lowell cop exposes shocking truths about the abuses of power within the city’s police department and the code of silence that keeps certain law enforcers untouchable. Alvarez laments the endless layers of police bureaucracy that undercut accountability and make it hard for problems to be addressed quickly and effectively. Anyone who disagrees with Alvarez’s account will at least have to deal with the immense amount of data he has collected in support of his cause. You will find real insight to those that were involved. This serious, terrifying undermining of our justice system is being ignored by those who can stop it.